If you’re not laughing yet, realize that fashion is never a word that has belonged in the same sentence with my name. Maybe I would be at the height of it if I walked into a medieval castle, a Civil War ballroom, or a British tea party–but as for the fashions of today, I’ve been chronically clueless since I was old enough to dress myself. That’s not to say I don’t like to look good in my clothes. Or that I don’t have a sense of taste (however eclectic it may be). But I’d consider that more “personal style,” a notion of what I like and what looks good on me, than an awareness of what Parisian designers are sending down the runways this season. However, in the last few months, fashion hasn’t been as far away from me as in the past. For one, my mom and I have been faithfully following a BBC show from the ’90s, The House of Eliott, which follows a pair of sisters who start their own fashion house in 1920s London. Besides having a great story with compelling characters, the show’s costumes are gogglingly gorgeous. And as I learn more about sewing and design, it helps me to better understand an industry that once seemed mysterious and ridiculous. Gaultier fashions on mannequins with moving faces! In addition to the costumes themselves (displayed on mannequins with moving faces! ), there was a documentary tracking the last 48 hours leading up to a Gaultier fashion show. Backstage, away from all the paparazzi cameras and snobbish facial expressions, was a busy hive of incredibly talented seamstresses who specialized in turning one man’s eye for whimsy into precise creations of stitches and sequins. Every garment for a fashion show is made completely by hand, some of them representing 200 man-hours or more. There’s also an enormous amount of creativity involved. Again, while I didn’t see any of the garments as really wearable for myself, conceptually I found them very interesting. 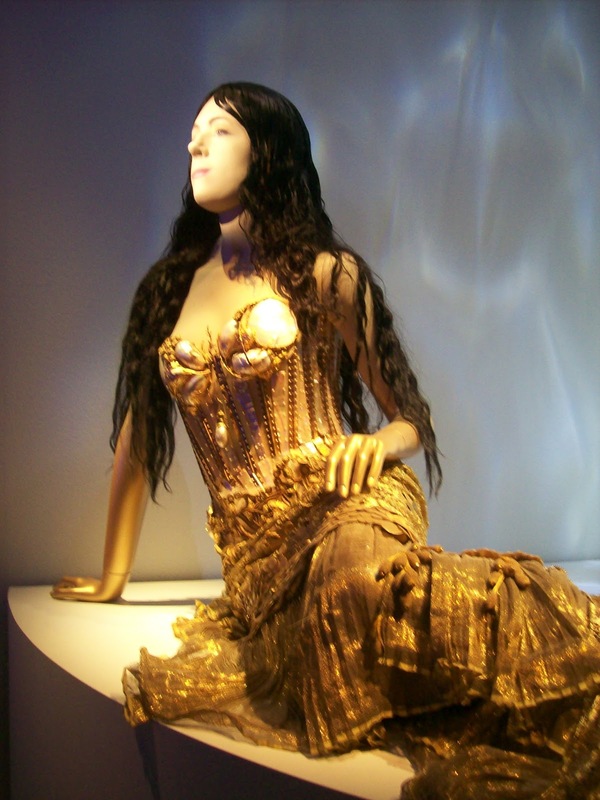 Gaultier experimented with unexpected materials and combinations: artificial crocodile skin and crochet, knit and tulle, gold lame and seashells, leather and feathers, even human hair. 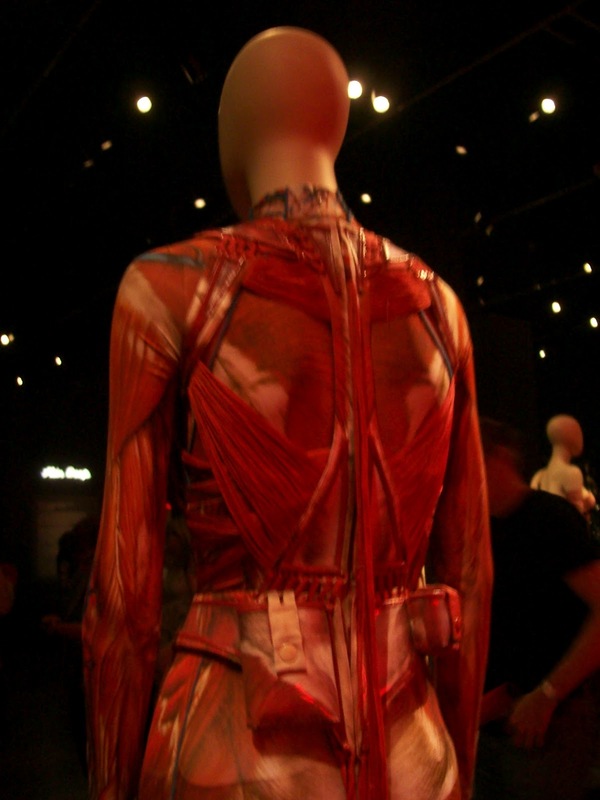 He also chose themes for his fashion shows that tickled my fancy as a writer: mermaids, madonnas, even human body systems. So, while you may never catch a glimpse of high fashion in my wardrobe, I have gained some respect for the field as a creative art and a highly skilled craft. I do prefer wearing my personal style, though. It’s my humble opinion that people always look best wearing what suits them, rather than whatever happens to be trending at the moment. What are your thoughts on fashion, style, and haute couture? I dress comfortably. Always have. I love the Victorian era, but wouldn’t never have lasted with all those underclothes. 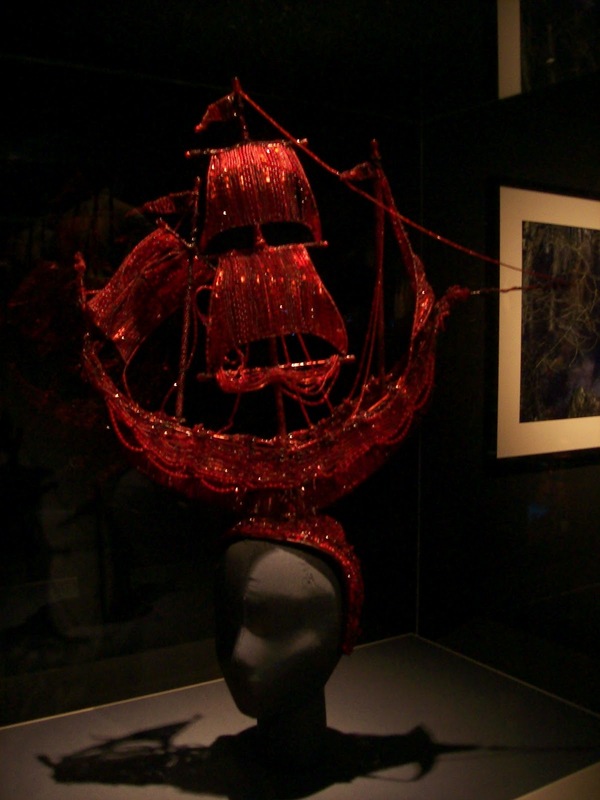 LOL Great blog, Alina, enjoyed learning about Jean Paul Gaultier. 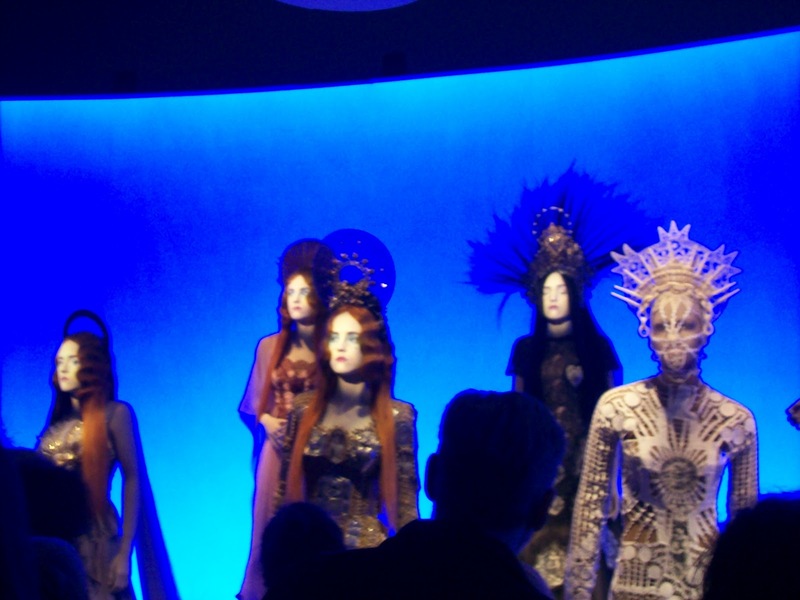 The Gaultier exhibit sounds fascinating, though the moving heads might have creeped me out a bit. 🙂 My mom is an expert seamstress and though I’ve tried to get to her level of sewing, I have more failures than successes. I can’t imagine the work it takes to sew one of those Gaultier dresses and head pieces. The moving heads definitely creeped me out! I’m pretty sure I stood there making awkward faces at them for a while. How cool that you at least try to sew–it’s one of those crafts that I wish I understood, but it positively boggles my mind. My hat off to your mom! I’m with you on the sewing: It’s a complicated and beautiful art! “Fashion” could be approached from many different perspectives, some positive, some not so much. BUT House of Eliott is in a class by itself: I’d call it “therapy,” especially when coupled with a cup of tea and a bit of dark chocolate :)…You’ve combined several different themes in this post and threaded them all together, like the sewing of different fabrics into one; nice work! Oooh, nice simile there 🙂 And I’m a big fan of House of Eliott therapy. 1 episode a day keeps the doctor away, right? I’m a comfort, “personal style” dresser myself but about two years ago, I got a long-term writing assignment for a small business that sold high fashion jewelry and accessories. Suddenly, I was following the news and videos about Milan, NY, Paris fashion shows. I was scanning all the high fashion websites and magazines. The only way for me to not take the this is ridiculous approach was to view the haute couture as art rather than clothes. This worked surprisingly well, as that is exactly what it is. Nobody wears the pieces from the super haute shows, as is. They are ideas that are then made wearable. Gave me a new appreciation for fashion design.